Imagine, if you will, a collage. Bits and pieces, different colors and textures, each incomplete on their own, are combined with an artist’s hand to create a cohesive whole. In viewing this collage, you may see different things, perhaps even different from what the artist intended. Also, each time you look at it, you may see something new. This is the beauty of art, in both visual and written form. 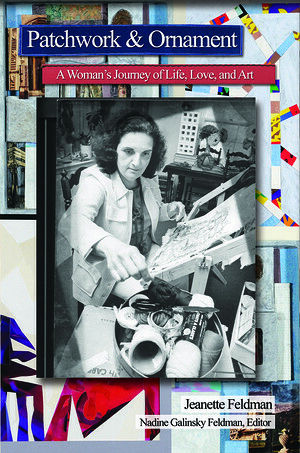 Patchwork and Ornament is a written collage, containing excerpts from Jeanette Englander Feldman’s journals, letters, and other writings that were found shortly after her death. Through essays, poetry, and stories, Jenny reveals a unique family history as well as her thoughts on travel, art, and life. The daughter of an immigrant mother and disabled father, Jenny Feldman grew up at the height of the Great Depression, living in poverty in the South Bronx. Through the power of art, travel, and culture, she transcended her humble beginnings and created a rich life filled with love, family, and creativity.